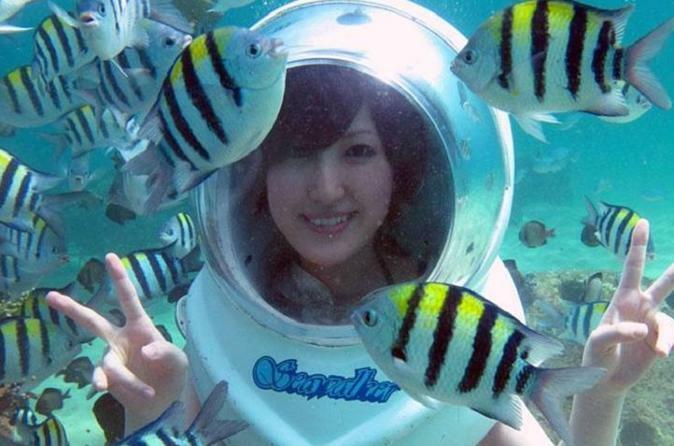 Seawalker tour is a unique opportunity to give you a new and innovating underwater experience. For many it means to break a barrier, to breath under water, but Seawalker makes it easy. The Seawalker is developed to be able to give the excitement of diving to everyone, even non swimmers. It’s simple, safe and a lot of fun. Seawalker is located at Sanur Beach, one of the richest reefs surrounding Bali. Shoals of reef fish, passing your helmet, close enough for you to touch. After changing into your swimsuit, then it’s off to the Seawalker station. It is only 3 minutes from the beach. Stay calm, the trained staff will serve you well, and you don’t have to worry. Fresh air is constantly supplied from a hose to the helmet. You go down the stairs to the bottom of the sea. The instructors will accompany with you the whole time through out the activity. With the unique helmet design, you can get face to face with the sea life and be able to take a breath, just like you would do on the surface – you do not even have to get your hair wet and you can still wear your glasses or contact lenses.